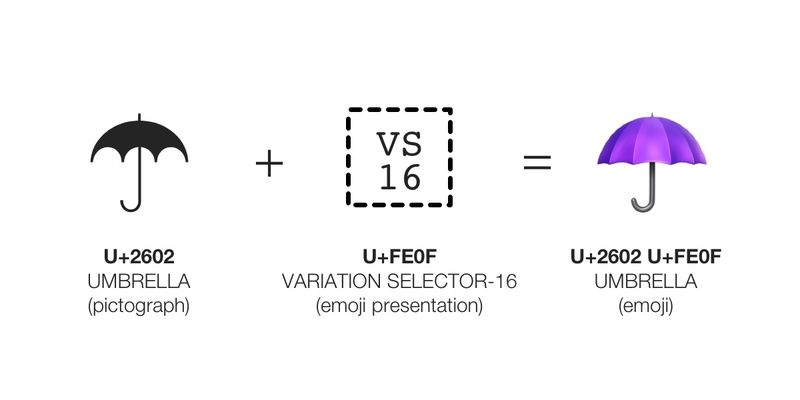 157 new emojis are coming in 2018, but two of these are already Unicode characters. What does it mean to be turned into an emoji? Included in the new 2018 emoji list is a chess pawn. This has been around in the Unicode Standard since 1993, but is about to get an upgrade. It's going to be Emojified. Above: Chess Pawn is a new emoji coming in 2018. What does it mean for previous uses of ♟ U+265F BLACK CHESS PAWN? Will they now show with a shaded emoji version in future? They might, but that depending on where you see it. Emoji isn't the only game in town when it comes to pictures-in-text. To communicate visually within text, you could send an emoticon :-) or kaomoji (o･ω･o) or a black and white pictograph ☺ encoded in the Unicode Standard. These characters have been in the Unicode Standard since the beginning. Examples include ✈ U+2708 AIRPLANE, ☁ U+2601 CLOUD and ☂ U+2602 UMBRELLA. When emoji characters entered the Unicode standard, a number of these overlapped with existing pictographs. The method chosen to handle this was to use the same base character for both text and emoji and allow an invisible character to determine whether it should be shown as text or emoji. 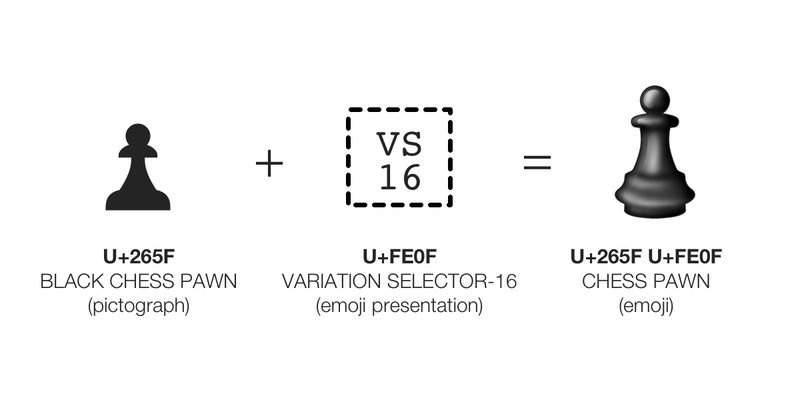 Above: Variation Selector-16 is an invisible character that informs the system to display a previously text-only character as an emoji. What about if neither are applied? That's where the confusion sets in. While most will display #2 and #3 consistently, #1 does vary from platform to platform. For instance, iOS chooses to display any pictograph as an emoji if an emoji version is available (regardless of whether the emoji presentation is specified). macOS on the other hand treats the base character as text, unless emoji presentation is specifically called for. Here's a chart showing various presentations for this character on macOS, iOS, Windows, and Android. 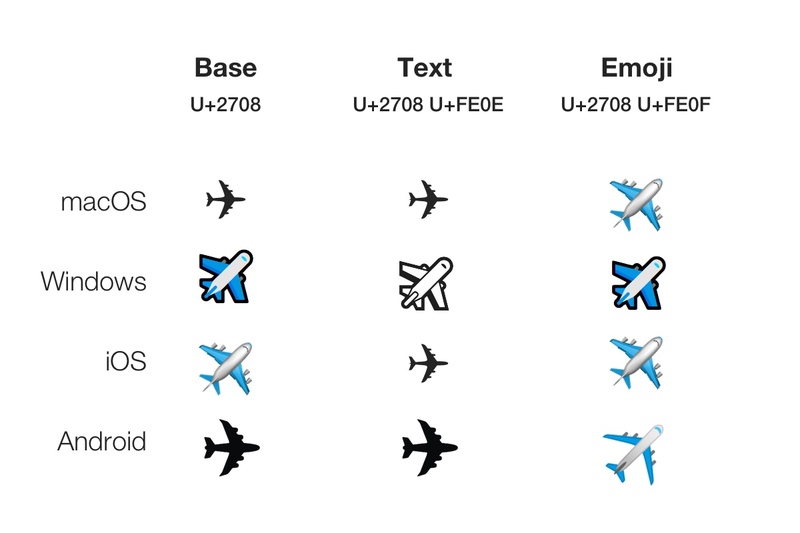 Above: The most recent version of each OS and how they display the airplane Unicode character. In response to questions about whether this chess glyph will start showing as an emoji everywhere: it depends on the OS (and app, for that matter). Most systems should append a Variation Selector-16 character after the chess pawn character when inserting from an emoji keyboard. Assuming this is done, it would mean that OS makers could safely continue to show the existing pictograph as the text glyph it has always been. Above: How the Chess Pawn emoji should display when implemented. Whether all apps and operating systems follow this pattern is yet to be seen. Some vendors may determine that users might always want the emoji, no matter whether it is specified or not. Oh and if you're wondering what the other character being emojified in 2018 is? It's an emoji for infinity, which has the name PERMANENT PAPER SIGN in the Unicode Standard. When writing this, I came across an article covering similar ground from Matias Singers while is also worth a read. There's also section 1.4.3 of the Unicode Technical Standard #51 which defines for how this all works.